While perusing my kids Christmas Lists the other day I noticed a familiar theme recurring, Lego in all its guises from the bricks and board games right through to video games. These children love Lego! It’s hardly surprising considering the enduring fondness both my husband and I have for the bricky stuff. 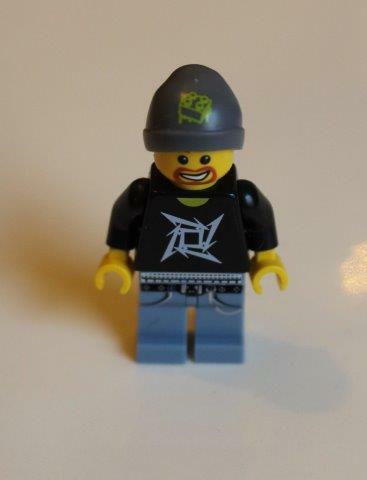 For my husband’s birthday I bought him a personalised Lego man complete with Metallica tshirt! As a family we’ve made several Lego animations which you check out on Youtube here. 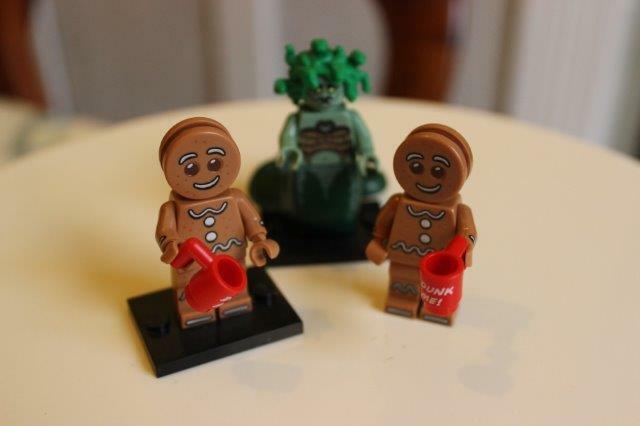 We’re all mildly (alright completely) addicted to the Lego Minifigure series. My kids are even quite adept at feeling the bags to find the right character, which explains these shelves that house their favourites. 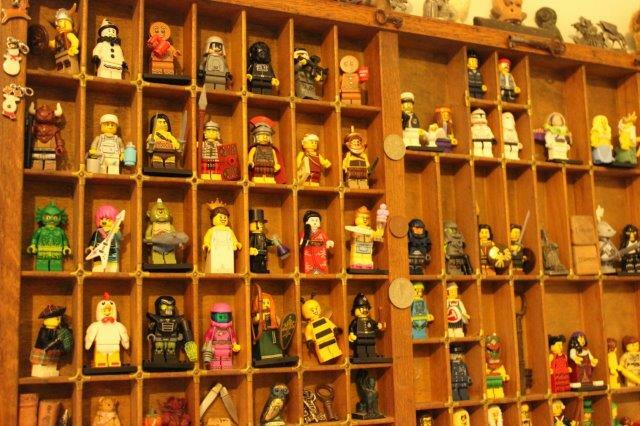 I’m sure you get the picture, we love Lego! I broke my brother’s Lego Technic Car! At the time I swore it wasn’t me, truly I had no idea what had happened or why the sophisticated Lego suspension had a clean break through the plastic. It was a mystery never to be solved or remedied despite many trips to toy shops looking for spare parts. The truth however is a dark and terrible thing. Not only had I broken the car, I’d also stolen it! Rather sensibly I had been forbidden to play with my brother’s new gift. Mini Abi was more than a little miffed by this rebuff and I took that car and hid it under my quilt. I planned to return later when no one was looking but instead I completely forgot what I had done. I did return but not to play with the Lego, instead I jumped up onto my bed with a bounce and a twirl and…….. I had jumped straight down onto the car! The carefully constructed suspension had broken in two and I knew instantly I was in serious trouble. Red faced and light of foot I smuggled that sad broken vehicle back into my brother’s bedroom, never to admit my shameful guilt. My remorse both for the crime and the lack of admission is profound! To my brother I want to say that I’m exceedingly sorry and I’ll buy you another Lego set if you’d like. Or perhaps I could take you along to the brand new Lego Movie next year instead? Comments Off on My Lego Shame! A couple of weeks ago I trotted off to the Lowry in Manchester with my children for a Dirt Devil Blogger Event. At the end of the day I was lucky enough to be given a Dirt Devil Easy Handheld to take home :). It has since been faithfully tested and put through it’s paces. I’m fairly sure my children spotted it before it came out of the box and vowed to be as messy as possible just to lend a helping hand :/. So with the details out of the way we come to the important stuff, does it actually do all those things and more? In a word, yes. If you’ve ever experienced a rechargeable or even corded handheld vacuum before, then it’s quite possible you fought long and hard to get it to actually pick up anything or hold it’s charge for longer than a minute. These kinds of machines are often bought to clean out cars because of the obvious wireless benefits. It was the starting point here as well, after our long day out my car looked anything but clean. 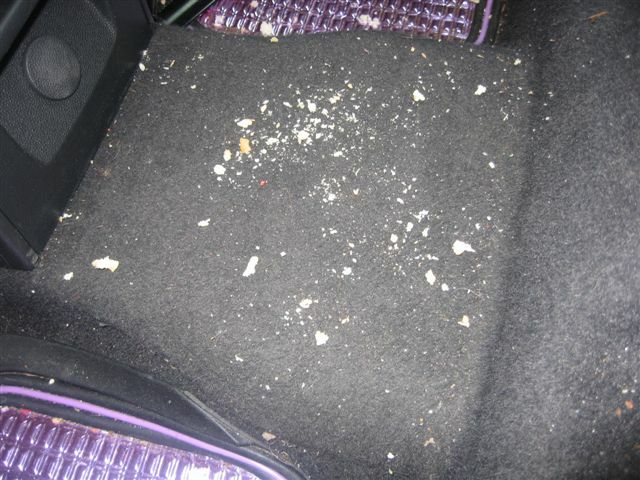 The kids all seemed to crumble food in the back and the floor looked suspiciously speckled. With great shame I shall show how the car floor started at the beginning of this experiment. Not exactly a pretty picture. I plumped for the Motorised Intense Turbo Brush for this job, and within seconds this is how the floor began to look. A significant improvement as I’m sure you’ll agree. In fact it was so good at cleaning the car that I felt compelled to remove all the car seats and matts and clean the whole thing! My car has never looked so tidy. All completed on one charge and with power to spare. Next I let the handheld loose on my large love seat. It was with great deliberation that I chose the fabric for this chair and with much chagrin that I realised it was not only pretty, it was a magnet for dust. It didn’t exactly complement the look that I was trying to create. 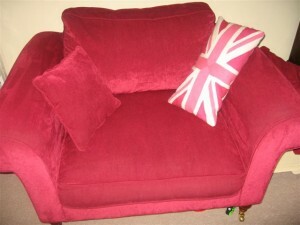 But after a quick clean with the upholstery brush it was back to looking gorgeous once more. In fact the Dirt devil sucked up so much dust off this one chair that I had to empty it twice! At this point that was the only problem, this compact little unit does require frequent emptying. But it’s take mere seconds to do, so it wasn’t a huge problem. Dust on the chairs and sofa is a particular bugbear of mine, so the advantage of being able to grab the Dirt Devil ready charged off it’s wall unit is fabulous. But it hasn’t all been rosy, I do have a teeny tiny complaint about the Dirt Devil Handheld. I should mention that this is actually due to it being really rather good at it’s job. But using the Turbo Brush attachment I was vacuuming up hair here, there and everywhere (apparently my daughter is molting at the present time). But within a very short period of time I seemed to be loosing suction. I emptied the vacuum and got a slight improvement. But on further inspection the Turbo Brush was completed wound up with hair and other gunk. I decided to clean the brush, but this is where the problem came. 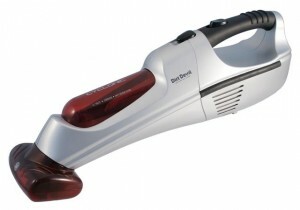 I am used to a vacuum where the brush is removable and cleaning is very quick and simple. But I couldn’t find a way to remove the brush in this case. It made for a rather laborious method of spinning and grabbing the brush to pull the debris from it. Of course once it was clean it was back to being fabulous. But it would be nice if it was as easy to clean as the whole unit is to empty. 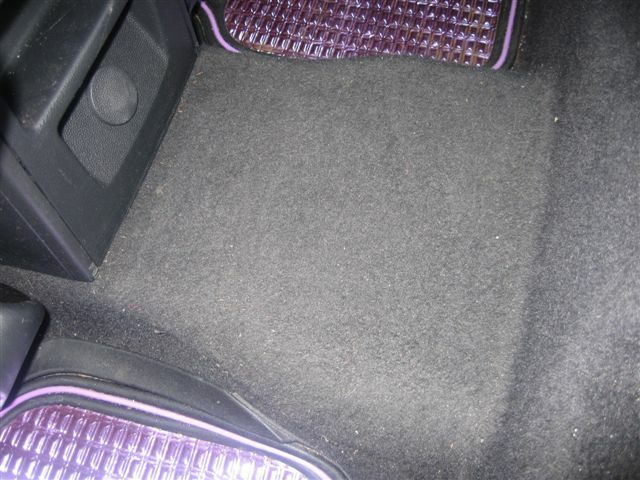 Yes, particularly for cars or those small spills that tend to pop up about the house. In fact I was so impressed it’s already cleaned several other cars to the delight of their owners. Apparently they are all going to buy their own Dirt Devil just for this job alone. As I mentioned I would prefer that the attachments were easier to clean. I would also love it if the battery lasted just a little bit longer, although on the whole it has lasted longer than the advertised 15 mins. Other than that it’s one powerful and compact piece of equipment. The Dirt Devil Handheld has an RRP of £59.99 and is available to purchase from Argos, Tesco and other leading retailers both online and offline. Further details are available on Dirt Devil’s website.